I did sprouts quite similar to this… roast for 20 mins w/ olive oil drizzled on top. After 20 mins add 1 spoon maple syrup and chopped pecans and roast for a further ten mins. Even my mother in law who hates sprouts loved them and my 2 and 6 year old :o) I shall deffo try the roasted carrots, ‘snips and pistachios though. 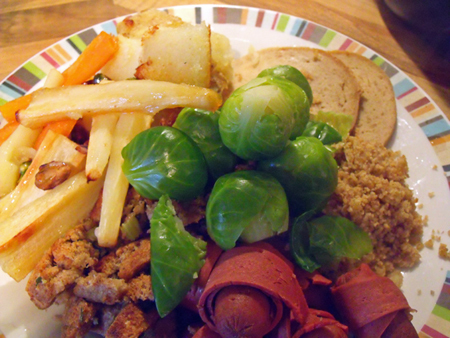 I did sprouts quite similar to this… roast for 20 mins w/ olive oiool drizzled on top. After 20 mins add 1 spoon maple syrup and chopped pecans and roast for a further ten mins. Even my mother in law who hates sprouts loved them and my 2 and 6 year old :o) I shall deffo try the roasted carrots, ‘snips and pistachios though. The sprouts sound great Jade! I had pistachios leftover from making the ice cream bombe.